A powerhouse TV producer and a charismatic defence attorney don’t usually have anything in common-but in Notorious these two influencers are the media-makers, opinion-shakers and the ones who ultimately control the justice system- one outrageous scandal at a time. Notorious starts on November 28 at 19h30 on M-Net channel 101. 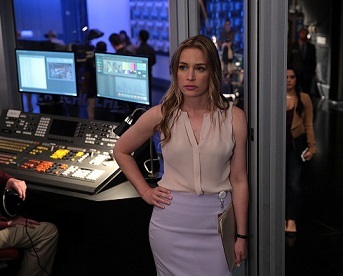 Julia George (Piper Perabo, Covert Affairs) is the brains behind a successful, highly-rated actuality show. On the flip side, Jake Gregorian (Daniel Sunjata, Graceland) is a charming, high-stakes defence attorney. Outward appearances would tell you that these two have no love lost between them, but secretly their symbiotic relationship is actually a cunning, ingenious ploy that helps them control the nation’s headlines - and courtrooms. In the premiere episode, Julia learns that an internet mogul named Oscar Keaton has been issued with an arrest warrant for fleeing the scene of a hit-and-run. Prepared to get the exclusive, she calls on the mogul’s lawyer and friend, Jake, places him in front of the camera and lets the drama unfold. Though it appears that they’ve both got full control of the situation, scandalous secrets soon start spilling out, forcing them to question everything they know. Inspired by the real-life friendship between famed criminal defence attorney Mark Geragos and award-winning cable news producer Wendy, Notorious stars Piper Perabo as Julia George, Daniel Sunjata as Jake Gregorian, Kate Jennings Grant as Louise Herrick, Aimee Teegarden as Ella Benjamin, J. August Richards as Bradley Gregorian, Sepideh Moafi as Megan Byrd, Ryan Guzman as Ryan Mills, Kevin Zegers as Oscar Keaton. Guest stars include Katie Couric as herself, Ramon De Ocampo as Levi, Dilshad Vadsaria as Sarah Keaton, Marc Blucas as Eric Jessup, Lisa Arrindell Anderson as Sergeant Betsy Powell, Matt Walton as Darin Mills, Candace B Harris as Staffer, Deric Augustine as Imran, Leonard Butler as Tony the valet, Kenneth Mitchell as Detective Matthews, Corey Sorenson as Councilman Davis, Melissa Marty as reporter #1, Matt Kaminsky as reporter #2, Raquel Bell Johnson as reporter #3, Jason Tobias as Shane Newsome, Kate Levering as Cassie Manheim, Bryan Adrian as forger.